The Best Big Mouth Juicer! DISCONTINUED This item has been discontinued by the manufacturer. The upgraded replacement is the Omega OMG500s. 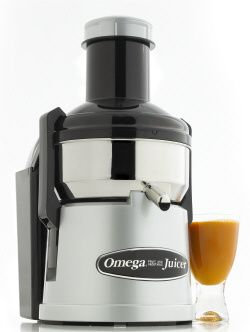 The Omega BMJ330 is Omega's NEW Big Mouth Pulp Ejector style continuous Juicer. The stylish look of the Omega Big Mouth Juicer will look attractive in any kitchen, either home or business. 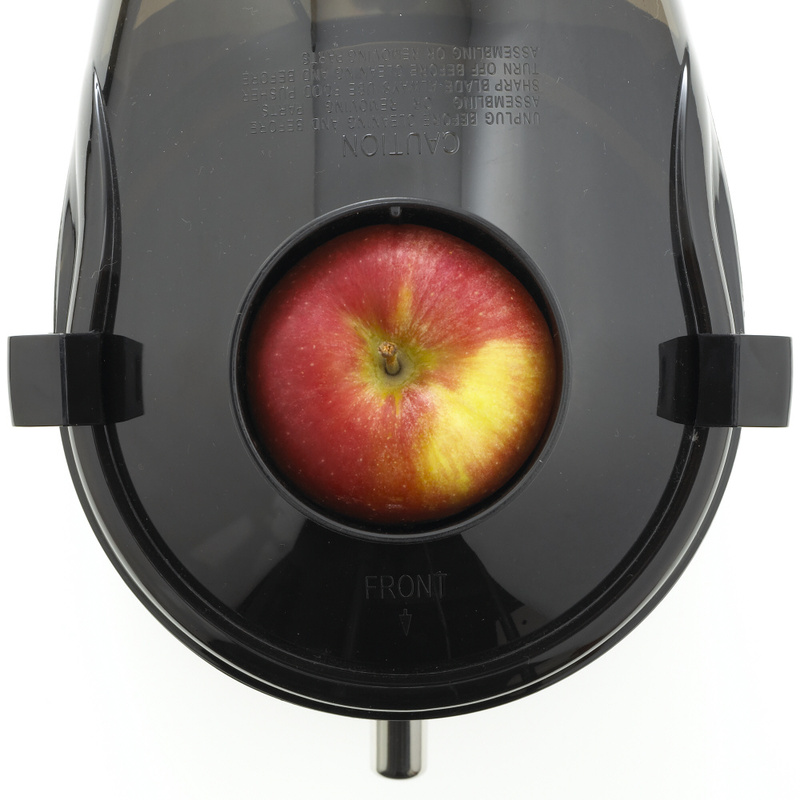 The Omega Big Mouth Juicer is stylish, durable, dependable, efficient and easy to clean. 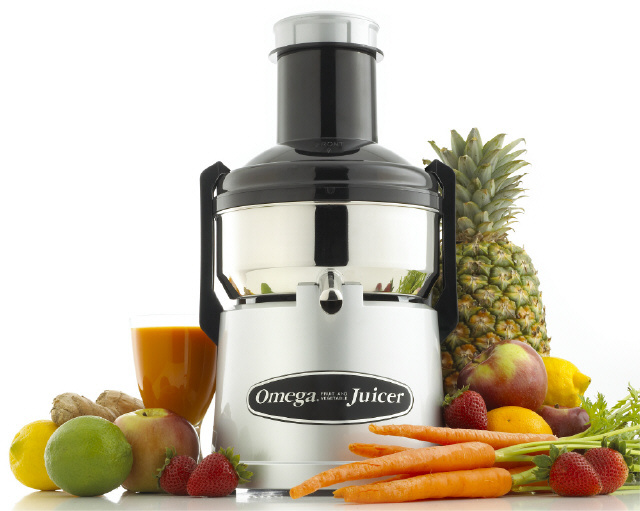 The Omega Big Mouth Juicer has the highest juice yield in the industry. Durable - Designed for the home, but built for Commercial use, this unit is as beautiful as it is practical, with an all stainless steel blade and basket for heavy duty use. Innovative - A new Big Mouth feed tube make preparation a breeze. What this means is that you spend less time cutting and more time juicing. Powerful - The most efficient commercial motor on the market guaranteed for a full 10 years- the best warranty in the industry! Simple - Single speed performance - no need to guess if you should be juicing at a low or high speed. Simply flip the switch and Omega's motor automatically extracts the maximum amount of juice from either soft or firm fruits and vegetables. Feed Chute: The chute of this juicer is the largest in the industry. It is large enough to juice whole apples (up to 3" in diameter). Basket: Although pulp ejector baskets do not need precision balancing, it is necessary to have it as balanced as possible. One of the most common problems with the cheaper imported pulp ejectors is that the pulp sticks in the basket and makes the unit vibrate. We have found the perfect speed (Rpm's), mesh size, and basket dimensions (angle, diameter, and clearance) to give you the most juice from this style juicer. The Basket is very open so it is easy to clean. Blade: This 1/2 lb. Stainless Steel Blade efficiently pulverizes fruits and vegetables to effectively extract the maximum amount of juice from a pulp ejector style juicer. When you hold the blade you'll appreciate its weight knowing how durable it will be. Our blade alone outweighs the blade and basket of many other juicers. Smoke Top: The top for this juicer has been painstakingly designed to achieve stylish looks while staying completely effective. This patented helical design reduces the chance of pulp from gathering in the chute and the juicer not clogging up. Most entry-level juicers will clog after processing just a couple of pounds of fruits and vegetables. Motor: The 1/2 Horsepower 11000 RPM. This highly efficient motor has been tested so well Omega is backing it with a 10-year warranty. Rubber Feet: Your new juicer will stand on a four evenly spaced feet. These feet are variable in height, which will help the unit keep from "walking" across your counter top. Bowl: The Bowl is manufactured from a thick, heavy duty gauge Surgical Stainless Steel. The outside of our bowl is polished to an attractive mirror like finish, the inside of the bowl is sandblasted to ensure a quick and easy clean up. Latch Arms: The cantilever style Latch Arms were a first in the industry. This allows for easy assembly and disassembly. Whether you're a strong athlete or suffering from arthritis, these Latch Arms will make it very easy to use this juicer on a daily basis. Receptacle Bin: This bin will hold pounds of pulp from your fruits and vegetables. A small, plastic refuse liner can be placed in the bin for easy clean up. Surgical Stainless Steel: The metal parts are all comprised of Surgical Stainless Steel. All of the Stainless Steel parts are either polished or sandblasted for functionality and attractiveness. Warranty: The Omega Big Mouth Juicer has one of the longest warranties in the industry. The Model BMJ330 carries a 10-year warranty. What's the difference between the Omega 4000, Big Mouth & 9000 Models? Feed Chute Size 1.5" x 3" 3" Round 1.5" x 3"
* Citrus attachment only makes it EASIER to juice citrus, and is not required. Please read this informative article for further information.